Brandon’s first school. The rear portion was built in 1881. The front part was added in 1883. An examination of the development of the public school system of Brandon during the 1880s illustrates the efforts made by Ontario immigrants to establish the social order of their home province on the agricultural frontier. While separate schools existed to accommodate the distinctive needs of the province’s Roman Catholic population, the development of Ontario’s system of free non-sectarian, public schools reflected an emerging consensus among the province’s English-speaking, Protestant population that only secular public schools could insure the progress and stability of the province. Ontario’s public schools were not unique, for similar institutions had evolved in countries as disparate as Australia, France, and the United States. Significantly, however, it was the Ontario system which served as a model for the development of public schools in the Canadian west. This was particularly the case in Manitoba where Ontario immigrants arrived in force after 1870. They were intent on recreating the institutions and social structures of their home province. In Manitoba a dual school system based on the Quebec model has been given legislative form following the creation of the province in 1870. With the influx of large numbers of Ontario-born, Protestant settlers during the 1870s and 1880s, support for Manitoba’s dual system was increasingly undermined. In Brandon during the early 1880s the principle of religious duality provided the framework for the creation of the earliest schools. However, it was clearly the Ontario model which guided the thinking of the city’s Protestant community leaders in the development of the city’s Protestant school, and which provided the example for the public school system created at the end of the decade. Brandon’s original population was drawn predominantly from Ontario. When the first census was taken in 1885-86, fifty-one percent of the city’s population had been born in that province. Further, it is probable that many of the twenty-three percent of Brandon’s residents who had been born in Great Britain had resided in Ontario prior to coming west. The Protestant character of the city was assured by the fact that Presbyterians, Methodists, Baptists, and Anglicans collectively comprised ninety-one percent of the citizenry. With only five percent of the residents Roman Catholic, of Irish and French Canadian descent, Brandon in the 1880s was clearly an outpost of Protestant Ontario linked to the east by rail, telegraph line and sentiment. The initiative taken by leading members of Brandon’s Protestant community in creating the “public school” reflected more than the depth of their sense of civic responsibility, for many were also family men with children to educate. When the Protestant school opened in February 1882, the original enrollment of fifteen was composed largely of children of Brandon’s original “better” families including the Shillinglaws, the Winters, the Johnstons, and the Mathesons. The fact that much of Brandon’s original population was composed of transplanted families ensured that the social prerequisites for school development were present. As in Ontario communities, the public school was considered essential for preparing the city’s school age population for a rapidly changing society. The rapid growth of the school enrolment from fifteen when the school opened to near two hundred by September, 1882 also demanded the expansion of the original building, which already had been divided into two rooms to accommodate different sections of the school population. On 23 October 1882 Reverend Ferries and W. J. White, of the Protestant Board, appeared before City Council to request that funds be made available for additional school construction. This request was acceded to, and in February 1883, the new school building, “... a brick structure of two stories, containing four rooms and forming a ‘T’ with the original buildings,” was occupied by the students and teachers of the Brandon Protestant School District. 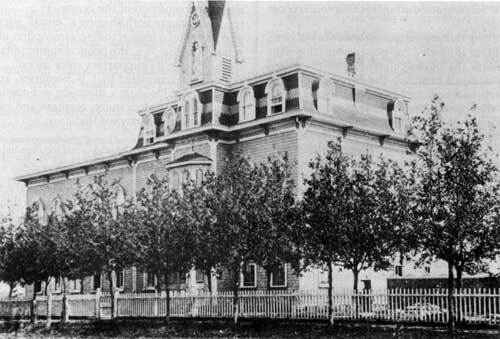 Unlike the city’s Catholic school, Brandon’s first Protestant school was constructed with funds secured when City Council issued $20,000 in debentures on behalf of the Protestant School Board. The close relationship between the Protestant Board and City Council was a clear acknowledgment that, as in urban centres of Ontario, Brandon had a public school which was an integral aspect of its general municipal system, and the subject of broad community interest. Ontario not only provided the model for the collegiate division in Brandon’s Protestant school, but its first teacher as well. In July 1883, the Board hired E. J. Popham as principal of public schools and teacher for the collegiate department. Popham had been born in Ottawa, and after attending public school there, entered the Ottawa Collegiate Institute preparatory to his matriculation in the Victoria University at Coburg, Ontario, from which he received the Bachelor of Arts degree in 1883. As in the case of T. J. Lamont, Popham’s administration of Brandon’s Protestant School was necessarily shaped by his experience and training in Ontario public schools. In summary, the rapid development of the Protestant school in Brandon reflected the fact that the city’s predominantly Ontario-born population viewed the school as an integral component of the social structure of the new opportunity. A school district had been created, a school opened, and with increasing enrolment the professional staff of the District had been augmented and students organized into sections including various scholastic levels. As well, the original building had been extended and a collegiate division added to the public school. While the school was denominationally based in keeping with Manitoba school law, its central features reflected Ontario origins. Brandon’s “better classes” had taken the first opportunity to create within the city a school which in many respects conformed to the model of public schooling in Ontario. The desire to emulate the educational achievements of Ontario was evident not only in the formal structure and staff of the Brandon Protestant school, but also in its curriculum and goals. Here, the influence of Ontario was assured through the use of textbooks “recognized as standard in Ontario.”  As in the eastern province, children attending Brandon’s Protestant school were exposed to a curriculum composed of reading, writing, and arithmetic supplemented at various levels with geography, British and Canadian history, hygiene, drawing, music, and bookkeeping. Significantly, the absence of supplementary materials ensured that the authorized text was the central focus of both teacher and student in the schooling process. In Brandon’s Protestant school, composition consisted of “repeating” stories related by the teacher. Part of the reading program, based on the Ontario Primer in the lower levels of the school, included the reciting of poetry learned by rote. Spelling involved the oral and written recall of words from the reading lessons. Arithmetic incorporated drill in a variety of procedures, including “mental” addition, subtraction, and multiplication, all of which served as a means of training the power of attention. Geography included the memorization of a variety of definitions and facts, and evidently aided “high intellectual training.”  In the collegiate division a narrow classical curriculum of Latin and English, Grammar, French, Geometry, Arithmetic, and Literature was available for the limited number of Brandon’s youth who planned to attend university or pursue a career in teaching. Aside from the importance of discipline to the pedagogical and administrative imperatives of the school, the preoccupation with regular attendance, punctuality, obedience, and the willingness of students to work for extrinsic rewards was important in socializing students to the rigours of the work place. As in urban communities in Ontario, the focus of economic life in Brandon made it probable that the majority of students attending Brandon’s Protestant school would find employment in small commercial establishments or manufacturing shops. By 1886 there were 149 businesses in the city. These were not all commercial establishments, for milling, planing, carriage, harness and pump manufacturing, and brewing were important sources of employment and income. By 1890, thirty-nine manufacturing and processing establishments, involving a capital investment of $378,505, employed a work force of 267 and paid $136,400 per annum in wages, while producing goods valued at $733,000. Instruction in habits and values which were functional in the work place was a central, albeit a largely unwritten feature of the school’s curriculum. 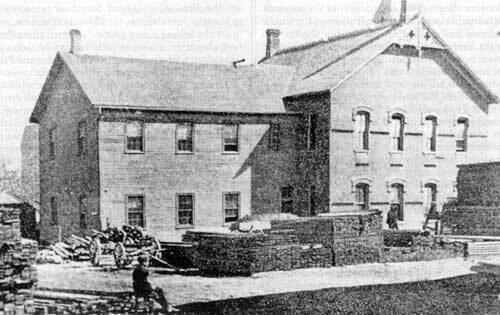 The subordination of children in the Brandon Protestant school had another purpose as well, for the Brandon school reflected the Ontario tradition that the ... development of the moral nature [of students] was a primary requisite of any system of education.”  Subsumed under the concept of “morality” was the development of a number of attributes of character including cleanliness, neatness, temperance, proper speech, and equanimity in the face of adversity or hardship. The belief that the development of morality and “character” were central responsibilities of the Brandon Protestant public school was articulated in not discouraged by Protestant community leaders. The curriculum outlines, in Reports of the Superintendent of Protestant Schools, and during teaching conferences held in the city. By the mid-1880s, the essential character of the Brandon Protestant school had taken shape, and it would remain stable until the latter years of the decade when the growth of the city’s school age population made the expansion of school facilities imperative. While it had been created on a denominational basis, Brandon’s Protestant School contained students of different Protestant denominations, and in its curriculum and goals it conformed to the Ontario model of public schooling. In addition to informing the development of Brandon’s Protestant school, the Ontario Protestant model of non-sectarian public schools shaped the attitude and actions of Brandon’s Protestant community towards the city’s Catholic school. During the early years of the decade the city’s tax-supported Catholic school was acknowledged as a valuable institution, but beginning in 1886 Protestant community leaders determined to discredit the Catholic school. Once this was achieved they sought to remove any obstacle to the efficient operation and development of public schools. The basis for such a system had already been created in the city’s Protestant school. The controversy over the Jesuit Estates question, which erupted in the spring of 1889, simply provided an opportunity for Protestant community leaders to press their case against Brandon’s tax-supported Catholic school and the province’s dual school system which they viewed by then as fiscally wasteful, socially divisive, and inappropriate to the broader national agenda of the Canadian community. The convent was a three storey building located to the south of Brandon’s commercial district on the corner of Third Street and Lorne Avenue. The two classrooms on the second floor of the Convent could accommodate one hundred pupils. “No place is healthier,” reported the Brandon Sun (a newspaper that would lead the province in a call for the abolition of denominational schools six years later), “and the situation of the Convent is amongst the best in the city.”  The curriculum at the Convent school, in which the language of instruction was English, paralleled that of the Protestant School. However, in addition to the standard subjects, students attending the Convent could receive instruction in French and Music. There was also religious instruction for Catholic students, from which the increasingly numerous Protestant pupils were excused. Specifically, Russell was referring to the instruction available in French and Music at the Convent, but not available in the Protestant school. In the same article, the Sun described the teaching staff of the Convent in glowing terms, outlined its extensive program of studies, and noted uncritically that Protestant children attending the Convent were more numerous than Catholics. The evidence presented above indicates that initially the attitude of Brandon’s Ontario-bred Protestant population toward Manitoba’s dual confessional school system was not antagonistic. Two developments changed this and laid the basis for an attack on the principle of duality. The first of these arose because of the increasingly difficult financial situation that the Protestant School Board experienced as the decade progressed. A financial crisis in 1885 led, by 1886, to demands that the basis of financing public education in the province be re-examined. The second cause of the change in attitude toward the City’s Convent school was the determination of militant Protestants that the attendance of Protestants at the Convent school must end. This determination led to a series of assaults on the Convent school in the summer of 1887. Both developments had the effect of undermining the model of denominational schools and encouraging a reassessment of the province’s education system. As mentioned earlier, the public schools of Manitoba were funded by local taxes, levied by local boards of trustees, and by provincial grants to the Board of Education for allocation to school districts. For the Brandon Protestant Board, the problem of finance existed at two levels. The continuous financial difficulties of provincial governments during the 1880s made it impossible for the province to provide significant financial support to local school districts. Meanwhile at the municipal level the economic malaise which followed the collapse of the boom of 1882 made it increasingly difficult to secure funds locally. As well, the Board’s inability to increase his salary resulted in the resignation of E. J. Popham, who had served as principal of the school and teacher for the collegiate division. The future of the Convent school seemed secure when in June, 1887 the enrollment rose to one hundred and ten students including seventy-five from Protestant families. However, during late June and early July, 1887 the Convent suffered a series of vigorous attacks initiated by leading members of the Methodist Church of Manitoba and the Northwest Territories, as well as Protestant community leaders within the city. A week after the withdrawal of the Clement children from the Convent school, Reverend C. Chiniguy of the American Protestant Missionary Society arrived in Brandon. Chiniguy, formally a Roman Catholic priest, had been excommunicated in 1858. He became a Presbyterian, and under the auspices of the Missionary Society travelled widely denouncing Roman Catholicism. While it is not clear whether Chiniguy’s visit was prompted by the reaction of Protestant community leaders to the attendance of Protestant children at the Convent or the controversy created by Emma Clement’s proposal, Chiniguy’s activities in Brandon were obviously designed to discredit the Convent school and discourage the attendance of Protestants there. The objective of this assault on the Convent school, initiated and orchestrated by militant Protestant community leaders, was achieved. When the Convent school opened in August, 1887, only fifty-two students appeared where there had been one-hundred and ten when school closed in June. The Convent had lost students, but more damaging was the fact that Brandon’s Protestants had come to perceive it and the Catholic school located there as an institution devoid of value. The assault on the Convent school did not begin out of widespread anti-Catholicism in Brandon as much as from institutional and metropolitan imperatives of the Methodist church in western Canada, and the fact that Brandon’s Ontario-bred population was responsive to the preoccupations of Protestant Ontario. A number of developments sustained this initial burst of anti-Catholicism. In February, 1888, a convention of the Orange Lodge which drew representatives from all parts of Manitoba and the Northwest Territories was held in Brandon. It was, the Brandon Mail observed, “one of the most important gatherings of the kind ever held in the province.”  The growing influence of the militantly anti-Catholic Orange Lodge coincided with the arrival of Jesuit priests in the city. Late in the spring of 1888 Father Robillard, who had served the city’s Catholic population since 1881, and who had developed cordial relations with many Protestants, was replaced by no fewer than three Jesuit priests: Father McDonald arrived in March, 1888, and Fathers S. J. Paquin and Ed Proux in August. When, in the spring of 1889, the national controversy over the Jesuit Estates question in Quebec erupted, it took little effort on the part of Brandon’s press and the city’s Orange Lodge to transform the debate on the Jesuit Estates issue into an attack on Manitoba’s tax-supported Catholic schools. The attitude of leading members of the city’s Lodge to Brandon’s Convent school was reflected in a speech made by Reverend Best of Brandon’s Baptist Church to a meeting of the Lodge on 11 July 1889. Best asserted unconvincingly that while no Orangemen wished to interfere with the rights of Roman Catholics, he could see no justification for the continued existence of the Convent school in the city. The city now had a comprehensive system of graded, formally non-sectarian public schools based on the Ontario model. This model had guided the thinking of the city’s Protestant community leaders in the development of the Protestant school in the 1880s. The arguments used in 1889 to urge the abolition of Manitoba’s dual school system also derived from the Ontario Protestant legacy of secular public schooling. 1. See A. A. Roscoe, The Manitoba Act in Transition, 1870-1896: The Transformation of Manitoba’s Political, Cultural Institutions (unpublished MA thesis, University of Manitoba, 1968); J. R. Miller, “D’Alton McCarthy, Equal Rights, and the Origins of the Manitoba Schools Question,” Canadian Historical Review, 54 (1973); Douglas Owram, Promise of Eden: The Canadian Expansionist Movement and the Idea of the West 1856-1900 (Toronto: University of Toronto Press, 1980). 2. Owram, Promise of Eden, p. 142. 3. For a discussion of the development of Ontario schools see Michael Katz and Paul Mattingly, (eds.) Education and Social Change: Themes from Ontario’s Past (New York: New York University Press, 1975); Alison Prentice, The School Promoters: Education and Social Class in Mid-Nineteenth Century Upper Canada (Toronto: McClelland and Stewart, 1977); Robert Stamp, The Schools of Ontario 1876-1976 (Toronto: University of Toronto Press, 1982); N. McDonald and Alf Charton (eds. ), Egerton Ryerson and His Times (Toronto: Macmillan, 1978); R. D. Gidney and Doug Lawr, “Egerton Ryerson and the Origins of the Ontario Secondary Schools,” Canadian Historical Review, 60 (1979). 4. Prentice, The School Promoters, p. 17. 5. Alan Child, “The Ryerson Tradition in Western Canada, 1871-1906,” in McDonald and Charton, Egerton Ryerson and His Times (Toronto: Macmillan, 1978). 6. Census of Manitoba 1885-86, pp. 10-11, 16-17. 7. Martin Kavanagh, The Assiniboine Basin (Surrey, England: The Gresham Press, 1966), p. 206. The provincial Board of Education in Manitoba, through its officials, encouraged the creation of school districts in the new territory. Groups of people who could “agree on the size of a school district and the location of a school site might form a school, if there were fifteen children of school age within the neighbourhood.” See Lovell Clark (ed. ), The Manitoba School Question: Majority Rule or Minority Rights? (Toronto: Copp Clark Co., 1968), p. 15, quoting S. E. Lang. Brandon’s first school district included the six sections of land south of the railway yards. See Kavanagh, p. 206. 8. Kavanagh, Assiniboine Basin, p. 135. 10. Like those of other nineteenth century commercial centres in Canada, Brandon’s “better classes” were composed of craftsmen, merchants, professionals, public employees, and successful farmers. See discussion of class in nineteenth century communities in Neil Sutherland, Children in English Canadian Society: Framing the Twentieth Century Consensus (Toronto and Buffalo: University of Toronto Press, 1976), pp. 14-15. 11. See Pioneers and Prominent People of Manitoba (Winnipeg: Canadian Publicity Co., 1925); Manitoba Library Association, Pioneers and Early Citizens of Manitoba (Winnipeg Peguis Publishers, 1971); The Story of Manitoba Vols. II-III (Winnipeg: S. J. Clarke Publishing Co., 1913). 12. Kavanagh, Assiniboine Basin, p. 208. 13. The Story of Manitoba Vol. III, pp. 347-49. 14. Kavanagh, Assiniboine Basin, p. 208. 15. Pioneers and Prominent People of Manitoba, p. 212. 16. Report of the Superintendent of Protestant Schools of Manitoba, 1882-83. 17. Kavanagh, Assiniboine Basin, p. 209. 18. Brandon Protestant School Board Minute Book, 1 March 1883. 19. Rolf Pedersen (ed. ), St. Matthew’s Cathedral, Brandon, Manitoba 1882, p. 5. 20. Report of the Superintendent of Protestant Schools of Manitoba, 1881, p. 2. 21. The Story of Manitoba Vol. II, pp. 189-90. 22. Brandon Protestant School Board Minute Book, 1 March 1887. 23. See F. Henry Johnson, “The Ryersonian Influence on the Public School System of British Columbia,” in D. C. Jones et. al. (eds. ), Shaping the Schools of the Canadian West (Calgary: Detselig Enterprises Limited, 1979), p. 35. 24. Brandon Mail, 3 February 1883. 25. See the comments made by Mr. Prendergast during a speech on the Greenway government’s school legislation in Clark, The Manitoba School Question, p. 59. 26. Stamp, The Schools of Ontario, p. 9. 27. See “Programme of Study of the Public School,” Brandon Sun, 15 April 1886: Report of the Superintendent of Protestant Schools of Manitoba, 1886, p. 28; Report of the Superintendent of Protestant Schools of Manitoba, 1887, pp. 42-43. 28. Prentice, The School Promoters, p. 34. 30. Brandon Sun, 9 October 1884. 31. Ibid., 15 May 1884. 32. Brandon Protestant School Board Minute Book, October 4, 1887. Discipline problems were not an uncommon feature of Board business. See Minute Book, 6 April 1886; 6 July 1886; 3 February 1887. Related to the issue of discipline was a charge made in August, 1886, that Trustees and teachers of the Protestant school were attempting to “hush-up” immoral conduct on the part of some students. See Brandon Sun, 12 August 1886. Mr. Shillinglaw, the author of these charges, was unable to substantiate them. See Minute Book, 13 August 1886. 33. Brandon Protestant School Board Minute Book, 7 December 1887. 35. See “Occupations in Transition: The Danger of Downward Mobility,” pp. 88-118, and “The Integration and Invigoration of the Labouring Classes and the Poor,” pp. 119-137 in Prentice, The School Promoters. 36. W. Leland Clark, Brandon’s Politics and Politicians (Brandon: The Brandon Sun, 1981), p. 4. 37. Report of the Superintendent of Protestant Schools of Manitoba 1886, p. 17. 38. For a discussion of Goggin’s career see Neil G. McDonald, “David J. Goggin: Promoter of National Schools” pp. 14-29, in Jones (et. al. ), Shaping The Schools of the Canadian West. 39. Report of the Superintendent of Protestant Schools of Manitoba 1886, p. 26. 40. Brandon Sun, 15 May 1884. 41. Ibid., 30 September 1886. 44. Prentice, The School Promoters, p. 115. 45. Brandon Mail, 3 February 1883. 46. Neil G. McDonald, “Political Socialization Research, The School and the Educational Historian,” in David C. Jones et. al., (eds.) Monographs in Education V: Approaches to Educational History (Winnipeg: University of Manitoba, 1981), p. 75. 47. Brandon Sun, 15 May 1884. 48. Census of Manitoba 1885-86, pp. 10-11. 49. P. J. O’Sullivan, By Steps, Not Leaps: St. Augustine of Canterbury Parish, 1881-1891 (Brandon: Inter-Collegiate Press, 1981), p. 5. 53. Annals of the Sisters Faithful Companions of Jesus 1883. (In the possession of the author.) The Order of the Faithful Companions of Jesus was “founded in France by a French lady, born Marie Madeleine Victoire de Bengy, widow of Anatola Joseph de Bonnault and known in religious life as Madame de Houet. The first convent was opened in Amiens, France in 1820. The first convent of the Faithful Companions of Jesus outside France was in London in 1830, the year of the Catholic Emancipation Act in England, ...” From a letter to P. J. O’Sullivan from Sister Teresa, F.C.J., September 19, 1979 in possession of the author. 54. Brandon Sun, 18 January 1884. 56. Annals of the Sisters Faithful Companions of Jesus, 1883. 59. Brandon Sun, 12 August 1886. 60. Brandon Sun, 18 January 1884. 61. Brandon Protestant School Board Minute Book, 23 June 1885. 62. Report of the Superintendent of Protestant Schools of Manitoba, 1886, p. 15. 65. Brandon Protestant School Board Minute Book, 24 October 1855. 66. Ibid., 23 June 1885. 67. Brandon Mail, 2 July 1885. 68. Brandon Sun, 18 January 1884. 69. Annals of the Sisters Faithful Companions of Jesus, 1886. 70. Annals of the Sisters Faithful Companions of Jesus, 1887. 71. W. H. Brooks, “Methodism in the Canadian West in the 19th Century” (unpublished PhD dissertation, University of Manitoba, 1971), p. 6. 73. Annals of the Sisters Faithful Companions of Jesus, 1887. 76. Brandon Sun, 7 July 1887. See Mason Wade, The French Canadians, 1760-1967 (Toronto: Macmillan, 1968), p. 390 for a detailed discussion of Chiniguy’s career. 77. Brandon Mail, 7 June 1887. 78. Annals of the Sisters Faithful Companions of Jesus, 1887. 80. Brandon Mail, 1 March 1888. 81. Letter to P. J. O’Sullivan, p. 7. 82. Brandon Mail, 11 April 1889. 83. Brandon Sun, 2 May 1889. 84. Ibid., 16 May 1889. 86. Ibid., 30 May 1889. 87. Brandon Mail, 4 July 1889. 88. Brandon Sun, 11 July 1889. 89. Brandon Mail, 11 July 1889. The Brandon Sun was supportive of the Manitoba Liberal Party during the decade. Provincial Liberals including J. W. Sifton and his son Clifford Sifton were Directors of the paper. The Mail was a Conservative paper. Charles Cliffe, its editor, was the President of the Manitoba Liberal Conservative Association in 1889. 90. Brandon Mail, 15 August 1889. See discussion concerning how the provincial press interpreted Smart’s speech in Miller, “D’Alton McCarthy, Equal Rights, and the Origins of the Manitoba School Question,” p. 388. 91. Brandon Protestant School Board Minute Book, 7 October 1890.